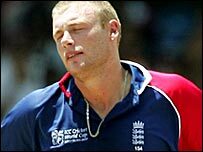 All-rounder Andrew Flintoff hopes to be fit enough to return for England in the one-day series against India. The Lancashire star has all but ruled himself out of the Tests, the first of which starts at Lord's on Thursday. Flintoff, who insists he can come back from a third ankle operation stronger than ever, has been batting in nets. "In terms of exact dates, it is hard to say. I hope to play a part against India, but the one-dayers are a more realistic target," he said. The opening international of the seven-match series takes place at Hampshire's Rose Bowl on 21 August. "The impatience is starting now. I've been back in the nets and I've been hitting them all right," added the 29-year-old. "Because I'm running now, doing proper things and working towards something, I can see light at the end of the tunnel and I have a temptation to get impatient." And he stressed that he was determined to regain his top form with the bat when he returns to the England team. "During the winter there was a clear dip in form and I want to get it back," he said. "The bowling was fine but I still think, no matter what I do with the ball, as a top-six batsman I will always get judged on the runs I score. "For two or three years I had things pretty much my own way, then I experienced the other side of it. "But I'm only 29 and I believe I've got my best years in front of me. I can do it again."